Jean Devine (left) and Jayden Pineda, 7, make a meadow at the Waltham Y.
I’m excited that today the Boston Globe caught up with my friend Jean’s terrific biodiversity-education outreach. Readers may recall that I blogged here and here about how she and Barbara Passero got started on “meadowscaping” — hoping to ween homeowners from using pesticides and herbicides that harm the environment and contribute to global warming. Debora Almeida reports on the educators’ latest work with kids: “Swimming, crafting, and playing games are staples of day camp, but kids at the Waltham YMCA are doing something new this summer. “They’re learning how to plant and cultivate a meadow — and why they should. 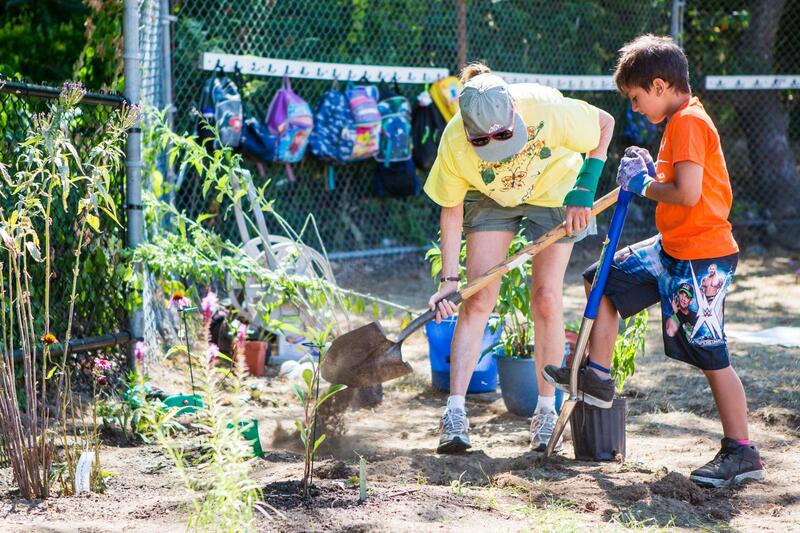 “ ‘We just want to save the world, that’s all,’ said Barbara Passero, cofounder of Meadowscaping for Biodiversity, an outdoor environmental education program for students of all ages, which has partnered with the Y for the project. “Over the course of the summer, Passero and program leader Jean Devine are teaching children the fundamentals of meadow upkeep and the importance of planting exclusively native plants. They are the best hosts for pollinators, such as bees, butterflies, and moths. In turn, the insects attract other wildlife such as birds and rabbits, building biodiversity. Such a happy story! Do read the whole thing here. My friend Bob says there is no bad weather, only bad clothing. So I headed out at lunch yesterday all bundled up to take some pictures. I think I’m stuck. Maybe songwriter Will McM will dig me out. While I’m on the subject, here’s a 1980s attempt at a song about cold, to be sung to the tune of “I’m Looking Over a Four-Leaf Clover.” Suzanne’s elementary school music teacher actually used it in class. And the birdbath is filled with ice? Go sideways down the street? Would keep fighting this cold war? And what did we move here for? Believe it or not, I kind of like the cold. And I love getting out and taking pictures. 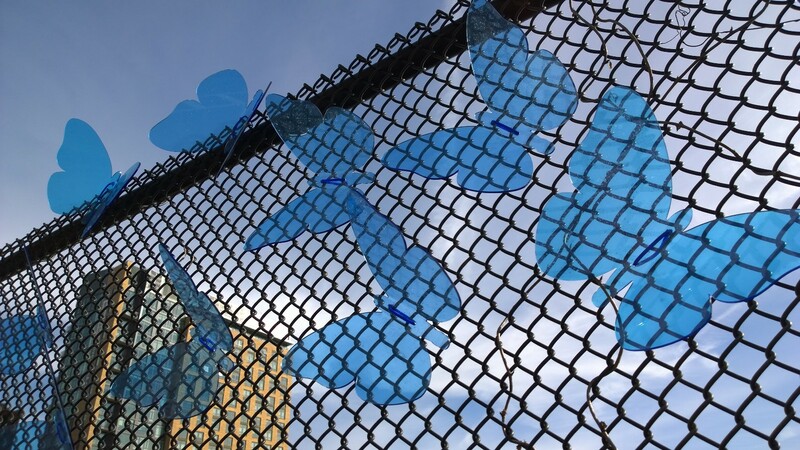 Yesterday I noticed a yellow Fort Point Arts sign on an old chain link fence. Then I noticed the butterflies. 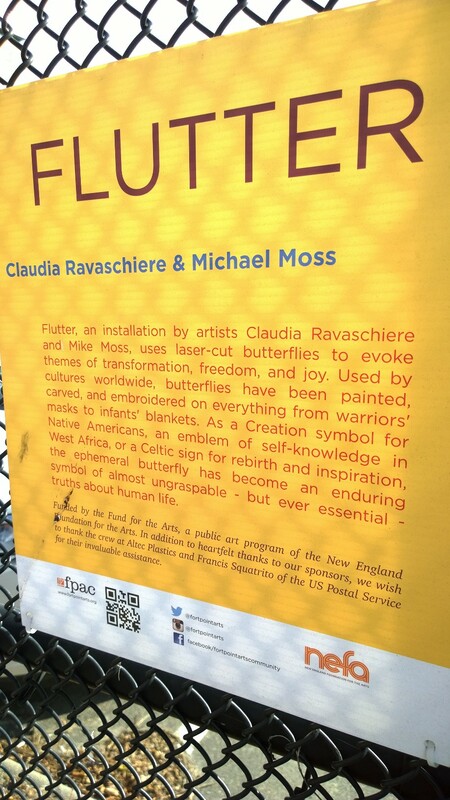 Read about Claudia Ravaschiere and Mike Moss’s installation, Flutter, here.